Your first visit to a gym may be like a child's first visit to a playground. If you are not prepared, you may run from equipment to equipment until you are exhausted and just want to go home. You can save yourself time and help to reach your exercise goals if you plan your workouts before you arrive at the gym. The American Council on Exercise recommends at least 30 minutes of cardiovascular exercise each day. Your gym will provide a variety of cardiovascular machines such as treadmills, stair climbers, bicycles, rowing machines, elliptical trainers and arc trainers. Your goal is to choose one that you enjoy and work vigorously on it for 30 minutes. You may also choose two or three machines and split up your time for 10 to 15 minutes on each. Strength training should be incorporated into your workout session. You burn calories and increase strength during weight training. For a complete body workout, incorporate one machine for every major muscle in your workout session. IDEA Health and Fitness Association recommends beginning with the larger muscle groups first, such as your chest and back before exercising your smaller muscle groups such as your arms and shoulders. You may begin with one set of 10 to 12 repetitions and as your strength improves, increase to two or three sets. Your weight selection should be one that produces fatigue during your final two repetitions. Stretching your muscles after your workout will help to reduce muscle soreness. Flexibility training also helps reduce your risk of injury as a flexible muscle will have an increased range of motion over a tight muscle. After your workout your muscles are warm and you will be able to sink into a deeper stretch. Each stretch should be held for 30 to 60 seconds. Your fitness center may offer a group exercise schedule that contains a variety of exercise choices. Exercising with a group and having a specific time that you are required to attend may motivate your workout program. 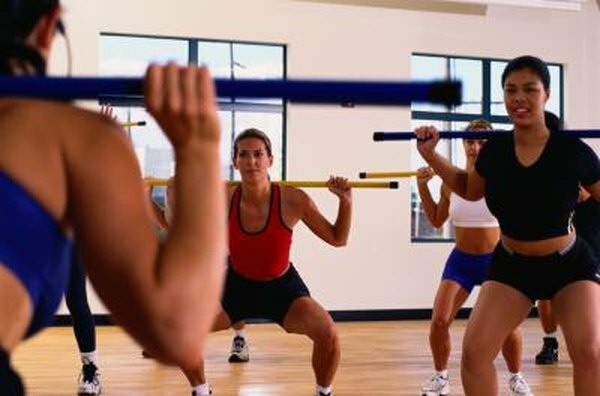 Group exercise classes can be cardiovascular such as step or kickboxing, strength such as toning classes, a combination of both you would find in a boot camp, or flexibility based as in stretching or yoga classes.